The organizing of the Holy Mother of the Rosary Church in Chicopee, Massachusetts is similar to the formation of the Polish National Catholic Church itself. Many churches, Catholic as well as Protestant, were organized in the 1890's, a period of religious suppression by many major Christian denominations. The faithful felt that their freedom of religious expression was being denied in the Roman Catholic Church. Many Independent Polish Roman Catholic churches emerged, of which Holy Mother of the Rosary Church was one. In general, the causes of dissatisfaction were unfair treatment of the people by the parish clergy and the hierarchy, denial of right to ownership of parish property and administration of its finances, refusal of the right to select parish priests, and assignment of non-Polish priests to Polish parishes. Specifically, the Polish immigrants had had enough of these suppresive actions in Poland and they did not propose to tolerate such actions within the Church in this land of the free. To these people the life of freedom which they found in America became too precious to be lost. Mr. Michael Frodyma residing in the city of Chicopee is hereby summoned to appear before the Rt. Rev. Bishop of Springfield on Wednesday evening, December 23, 1896 at 7:30 o'clock at the Episcopal Residence to listen to the reading of the sentence passed by the Episcopal Court of Springfield as a result of the regular canonical trial held November 23, 24 and 25, 1896 concerning the accusations made against Rev. F. S. Chalupka. In reply to the summons, Michael Frodyma, accompanied by Stanislaw Boron, went to the residence of Bishop Thomas Daniel Beaven on December 23, 1896 to hear the sentence passed by the Episcopal Court. The decree did not satisfy the grievances of the petitioners. Perhaps Bishop Beaven was unable or even unwilling to satisfy their demands. In the same year, 1896, representatives from Chicopee were sent to the Rev. Stephen Kaminski of Buffalo, New York. This delegation sought advice from Rev. Kaminski because he had recently been elected a candidate for Bishop by the Synod of the Independent Polish Roman Catholic Churches in North America. The delegation sought guidance in forming a new parish independent of the jurisdiction of Rome. With foresight, some people felt that land would be needed for the erection of an Independent Polish Roman Catholic Church. Therefore, Daniel Twarog and Wojciech Boron purchased the parcel of land at Bell and Elm Streets in Chicopee from Clara M. Bell on January 5, 1897 for the amount of $1,645. Preliminary plans for the organizing of a new parish were formulated and presented on January 11, 1897 at a mass meeting held at Welsh Hall in Chicopee. The plans were accepted and a temporary committee was elected to conduct the affairs of the new parish. It was at this meeting that the name "Holy Mother of the Rosary" was selected. At the request of the newly-formed parish, The Rev. Stephen Kaminski of the Holy Mother of the Rosary Independent Polish Roman Catholic Church of Buffalo, New York assigned The Rev. Valentine Gawrychowski as pastor. On January 17, 1897 the members of Holy Mother of the Rosary Church greeted and accepted Father Gawrychowski as their spiritual leader. 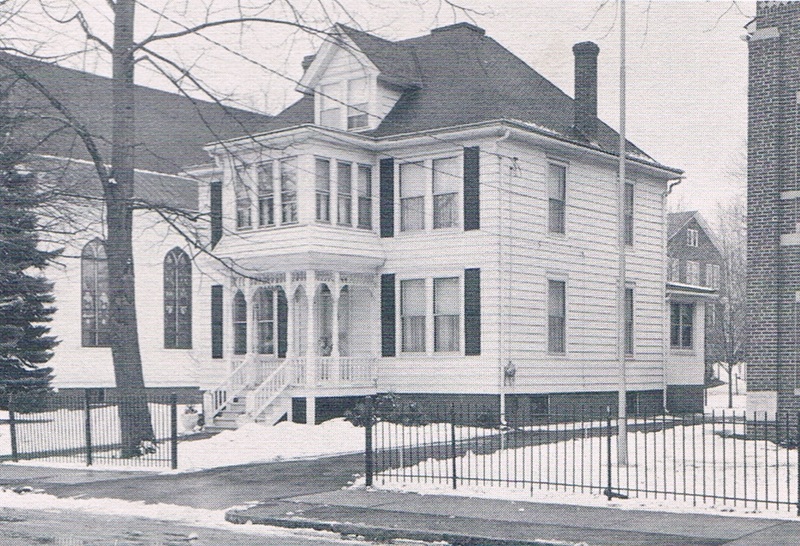 Beginning in January, even before plans for the construction of the church were formulated, Holy Masses were celebrated and all religious services and ceremonies were conducted in the newly-built home of Daniel and Apolonia Twarog at 21 Chicopee Street At this same meeting on January 17, a tentative parish constitution was read and unanimously accepted. 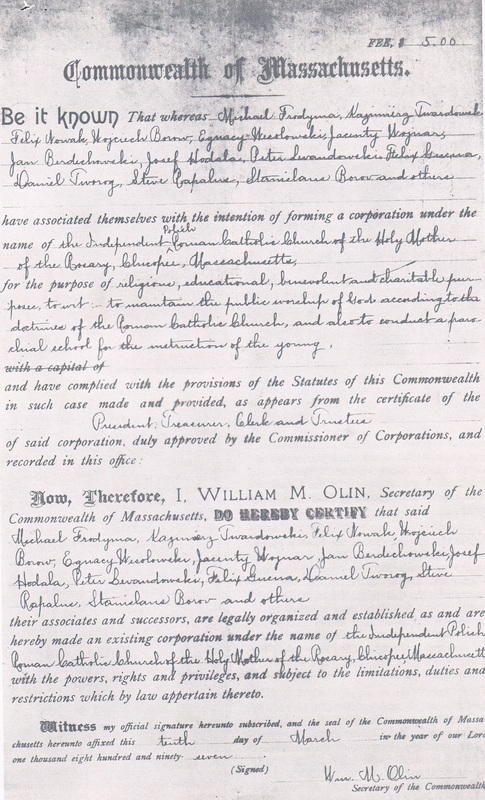 In order to obtain a Charter of Incorporation in the Commonwealth of Massachusetts, Attorney James H. Loomis was engaged to draft the Articles of Incorporation and other necessary documents. On February 1, 1897, twenty-four parishioners subscribed their names to an agreement to constitute the corporation—"Independent Polish Roman Catholic Church of Holy Mother of the Rosary, Chicopee, Massachusetts" and they also subscribed their names to the Certificate of Organization. On February 12 the parish committee met with Attorney Loomis and, in accordance with legal requirements, the officers of the parish committee were elected and the oath of office was officially administered to them. The Certificate of Organization of the "Independent Polish Roman Catholic Church of Holy Mother of the Rosary, Chicopee, Massachusetts" was approved by the Commonwealth of Massachusetts and a chatter was issued on March 10, 1897. On March 22, 1897 Holy Mother of the Rosary Parish purchased the land on Bell Street from Daniel Twarog and Wojciech Boron. One month later, the property was paid in full. In May plans and specifications for the yew church were prepared by the architectural firm of Chickering and O'Connell. After the plans were accepted, construction of the church began in June under a contract with LaFrance and LaRiviere at a cost of $13,500. During the period of construction, preparations were made for the installation of stained glass windows and church furnishings, which were later purchased and installed. This period in the history of our parish was a very trying and difficult one. The members were called names and spat upon; they even had rocks and objects thrown at them. Despite the ridicule and humiliation which these members faced, they succeeded in fulfilling the plans for their new church. However, it became necessary to maintain a guard outside the church to protect it from being destroyed by those who were unsympathetic to this new parish. 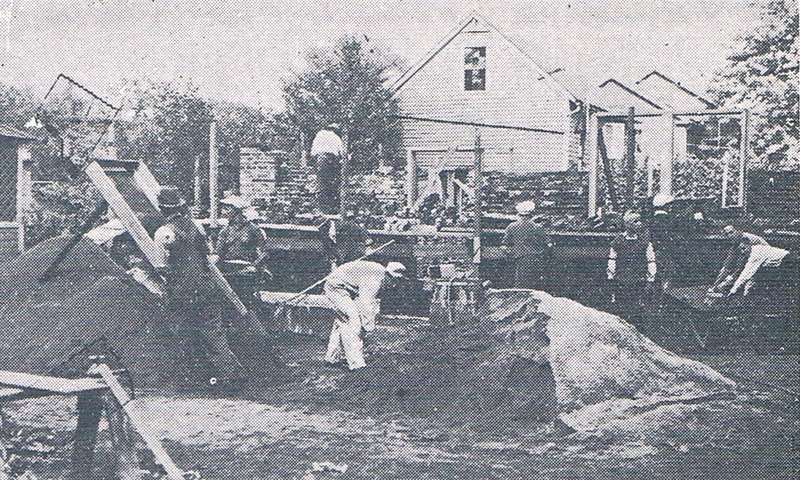 The parish realized the eventual need for a cemetery and on June 23, 1897 a four and one-half acre plot of land on Bennett Street, Chicopee, was purchased for this purpose. At a meeting of the parishioners on October 22, 1897 it was decided that the parish build a rectory as soon as possible. Construction began at once and the rectory was completed in the early part of 1898. During the first year Father Gawrychowski guided the parish toward a more stabilized existence. The need to organize and guide other parishes was great during this period. Therefore, in January 1898 Father Gawrychowski answered the call to assist in organizing a parish in Baltimore, Maryland. When Father Gawrychowski left, a void was created which left the local parish in a chaotic condition. All of the early pastors, former Roman Catholic priests, were under constant pressure from their brother priests and the hierarchy to return to the Roman Catholic Church. Because of this pressure, many of them returned to their former communion. Due to the infidelity of such clergy, many loyal priests returned to serve the local parish for as many as three distinct pastorates. Although some parishioners followed the dissident priests back to the Roman Catholic Church, enough parishioners remained steadfast to their ideals so that the parish was assured a continuous existence. At times when there was no pastor, prayer services were conducted by the faithful. The parishioners felt that the church property should be distinctly separate from the cemetery property to avoid any problems in the future. Therefore, in the summer of 1899 the parish cemetery was incorporated as a separate entity and remains so today. Nevertheless, problems arose during the period from 1900-1905, when the cemetery property was lost through what is believed today to have been financial difficulties. The cemetery was saved from being completely lost when several parishioners purchased the property and later sold it to the parish. The parish records show increasing contacts with clergy of the Polish National Catholic Church, especially The Rev. Francis Hodur. It would appear that the shortage of clergy in the independent parishes was forcing a closer relationship with the Polish National Catholic Church. 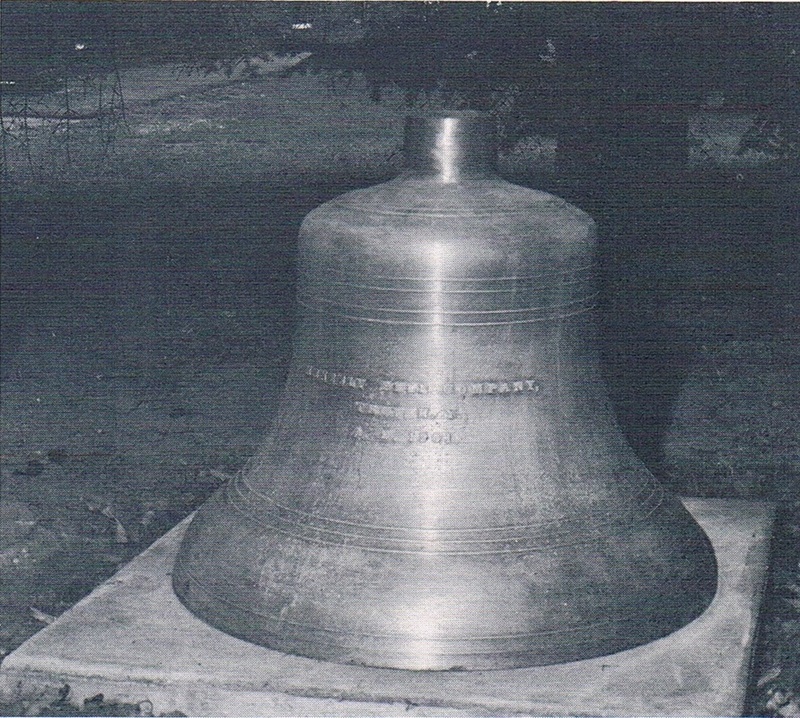 From henceforth, this bell, named Maryan, will ring loud and clear to the glory of God in calling the parishioners to worship. The deeply religious will heed the call and come to pray with bowed heads to the Lord of Lords. Others who do not respond to the call here surely will do so when they hear the sound of the archangel's trumpet. In 1901 vandalism against the parish property was still rampant, so much so that a solid wooden-board fence was built by parishioners to protect their church building. In the early 1930's, this protective fence was no longer required and was replaced by a decorative iron fence. On August 22, 1906 a Special Synod of the Polish National Catholic Church was held at Scranton, Pennsylvania. As affiliation with the Polish National Catholic Church was growing closer, a delegate representing Holy Mother of the Rosary Parish in Chicopee attended this Synod. It is worthy to note that the first pastor of Holy Mother of the Rosary Parish, The Rev. Valentine Gawrychowski, served as Vice-President of that Special Synod and assisted Bishop-elect Hodur in conducting the sessions. In August 1909 Holy Mother of the Rosary Parish was again represented by a delegate at the Second General Synod of the Polish National Catholic Church held at Scranton, Pennsylvania. On a number of occasions Father Hodur visited our parish. As recommended by Bishop Hodur at the Second General Synod and decided by the Synod Body, all Independent Polish Roman Catholic Parishes were encouraged to officially change the title of parish property to avoid legal problems. Therefore, on June 7, 1911 at a special parish meeting, it was unanimously decided to change the name to the "Polish National Catholic Church". 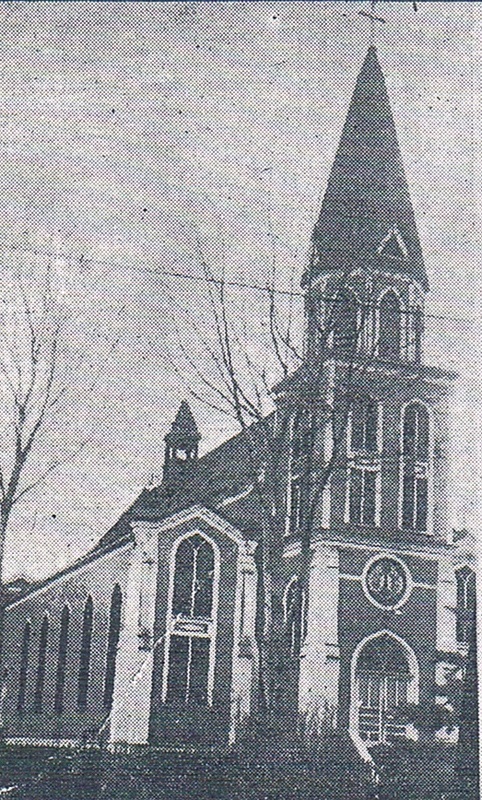 The name of the church was officially changed on January 19, 1912. 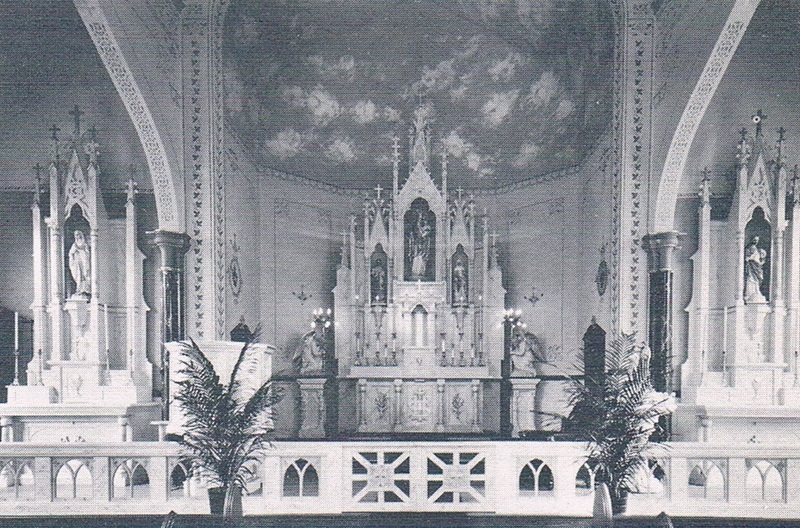 On August 17, 1924 the parishioners of Holy Mother of the Rosary Church rejoiced when their first pastor, The Rev. Valentine Gawrychowski, was consecrated a Bishop of the Polish National Catholic Church in Scranton, Pennsylvania. Bishop Gawrychowski was assigned to head the newly-formed Eastern Diocese, which included thirty parishes in New England. Bishop Gawrychowski chose the Chicopee church as his cathedral parish and the see of the diocese, because he had organized the parish and it was centrally located within the diocese. He assumed the pastorate of Holy Mother of the Rosary Parish in October 1925. Under his spiritual leadership, many changes occurred. In less than ten years, the parish membership was substantially increased, the parish property was improved, and new parishes were organized in Ware, Adams, and South Deerfield, as well as missions in Holyoke, Ludlow, and Easthampton. In 1931 Bishop Gawrychowski spent four months doing missionary work in Poland, inspiring the Polish people with the principles and ideals of the Polish National Catholic Church of America and striving to establish active missions there. 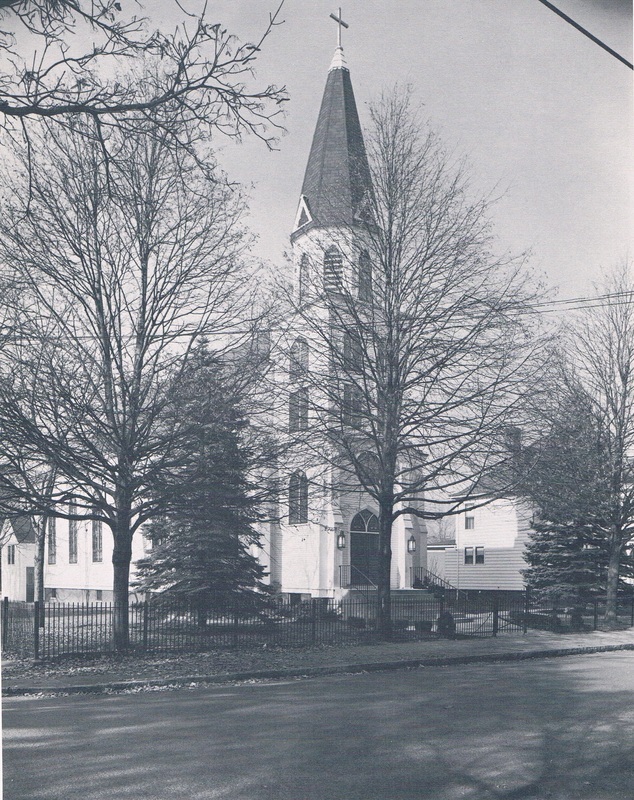 In 1926, during the pastorate of Bishop Gawrychowski, it was decided to purchase the land on Elm Street adjoining the church property for future use. The owner of the land decided to sell it to the Casimir Pulaski Hall Association, which had expressed the desire to erect a building to be used as a social club. The majority of the men of the Pulaski Club were members of the Polish National Catholic Church and the true intention of the Pulaski Club was to buy this property for the church, because the church could not purchase it directly. To complete this transaction, the Queen Hedwig Society paid $600, a portion of the total price, to the Pulaski Club. The balance was considered paid when the Pulaski Club accepted the sum of $1.00 from the parish. 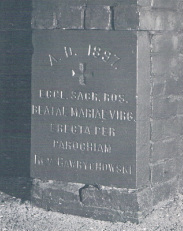 With foresight, Joseph Owczarski, a member of the parish, purchased the land adjoining the church property on Bell Street in 1919. After holding title to this property for many years, on March 28, 1932 he sold it to the parish for the sum of $500, with the stipulation that a parish school be built on it. Following the suggestion and advice of Bishop Gawrychowski, it was decided by the faithful to erect a school building and a fund-raising drive was instituted. 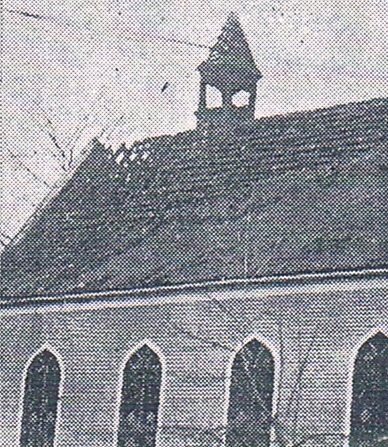 Preliminary plans were made, however, the school was not to be constructed at this time – fire gutted a portion of the church on April 2, 1933. Priority was given to the rebuilding and refurbishing of the church. 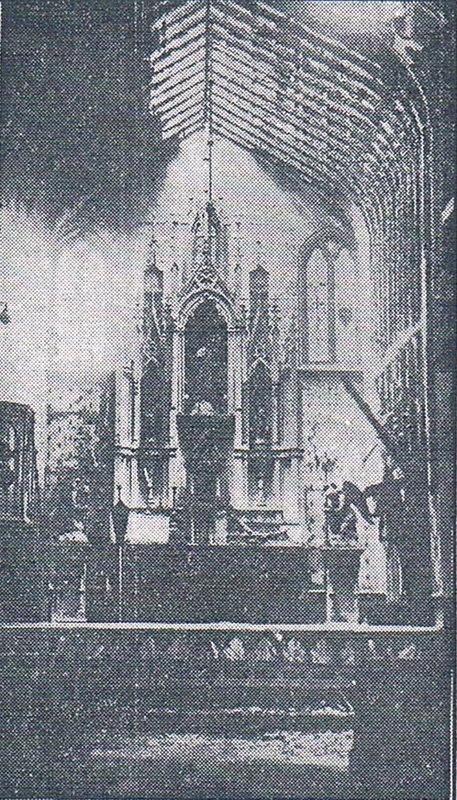 The fire of unknown origin destroyed portions of the sanctuary, the roof and the pipe organ. It was believed that the fire started in the boiler room directly under the main altar and as a result the altar and the sacristy suffered the most damage. Inspection revealed that the building was still structurally sound. Therefore, the task of rebuilding was greatly facilitated. 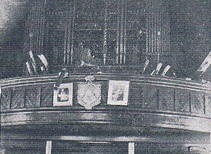 A special meeting was held on April 9, 1933 to make plans to repair the church. As a result of this meeting the architect George Dion was engaged to draw up plans and specifications. When the plans were accepted, a contract was signed with Charles Papiernik on May 22, 1933 for $11,600. In spite of the Great Depression, the parishioners contributed generously from their meager financial resources. 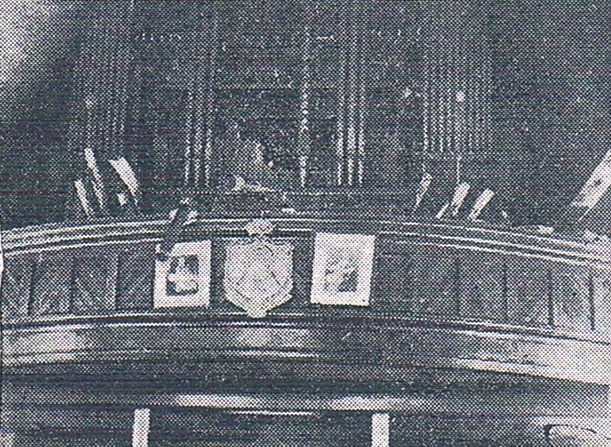 During the rebuilding of the church, Masses were celebrated in the old school building, since demolished, which was located directly behind the rectory. The church was slightly modified by the elimination of the rear belfry. Due to the smallness of the sanctuary, it was decided to enlarge it by moving the communion rail to include all three altars. The pipe organ was repaired at an additional expense. Within five months, the renovation of the damaged church was completed. 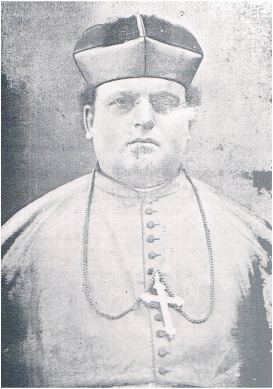 On October 29, 1933 Bishop Francis Hodur, assisted by Bishop Gawrychowski and most of the clergy of the Eastern Diocese, participated in the rededication of the church. Bishop Gawrychowski and the parishioners rejoiced in the restoration of the church edifice. Joy was short lived, for on February 1, 1934 the beloved pastor and Diocesan Bishop, The Rt. Rev. Valentine Gawrychowski, died. The funeral was held at Holy Mother of the Rosary Church with Prime Bishop Francis Hodur officiating. Many priests of the Church, faithful laymen and distinguished guests gathered to pay their last respects to this dedicated soldier of Christ. The funeral was attended by approximately 3500 people and interment was in the Holy Mother of the Rosary Parish Cemetery, Chicopee. 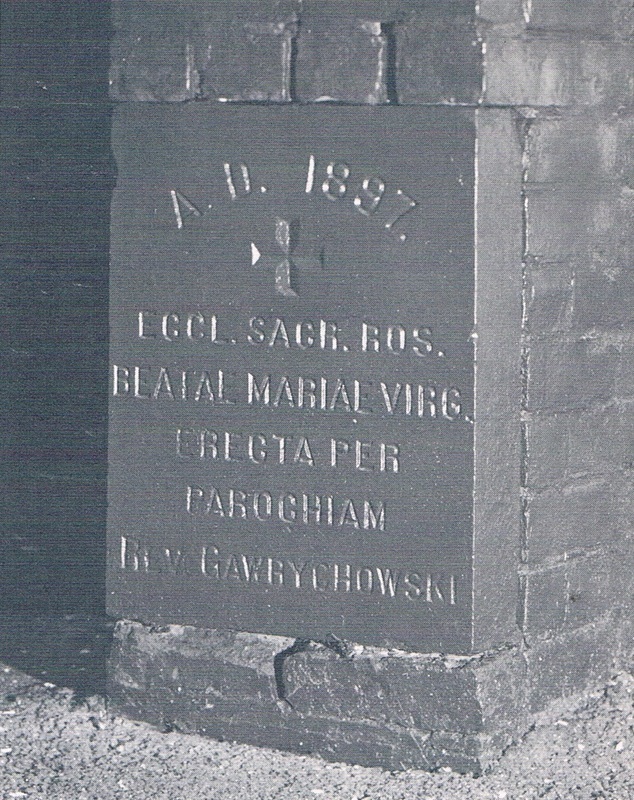 Bishop Gawrychowski did not live long enough to see his idea, the building of a parish school, become a reality. The campaign to raise funds for the school building, interrupted by the necessity of rebuilding the fire-damaged church, was again resumed. On September 29, 1936 a Building Committee was elected to formulate plans for the construction of a parish school hall. After the plans were accepted, Michael Mitrowski was hired as the contractor for this project. Despite the fact that this was still the period of the Great Depression, the parishioners were determined to build a school hall. Because of their love for the Church, they were willing to sacrifice their time, labor and limited finances. Under the pastoral leadership and with the encouragement and guidance of The Rev. John Toporowski, necessary materials, both new and used, were gathered before construction began. Due to the scarcity of money, the parishioners used every means to build the structure at the lowest possible cost, yet maintaining high quality construction. For example, both men and women donated their time and energy chipping mortar from the used bricks, so that they would be ready when needed by the contractor.